To help promote the summer blockbuster “Jurassic World: Fallen Kingdom,” Amazon used video to show that you can order just about anything on the site, including, perhaps, even things that are extinct. 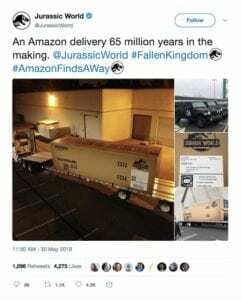 As SyFy Wire reports, the ecommerce titan posted a video to its official Twitter page, showing a worker approaching an box with airholes that was large enough to hold a T-Rex. Another tweet revealed that it was addressed to Owen Grady and Claire Dearing, the characters played by Chris Pratt and Bryce Dallas Howard in the films. The hashtag #AmazonFindsaWay is featured in the tweets. On Twitter, numerous people posted pictures of the enormous box on the back of a flatbed truck, making its way through the Los Angeles area. Tool of North America helped design and create the campaign, including the design of the actual box and the citywide experiential event. Major sponsorship partners include Jeep, whose vehicles have long been featured in the “Jurassic” series. Jeep kicked off its campaign with a 60-second spot during the Super Bowl in February. The ad features actor Jeff Goldblum “test driving” a Jeep as he outraces a dinosaur. A fleet of black Jeep Rubicons bearing the iconic Jurassic World logo are shown in the Amazon tweets as well. In the food and beverage aisle, Doritos and Dr. Pepper are first time partners for the brand. Overseas, snack fans will reportedly get to taste a limited edition Doritos Raptor inspired “Blue” chip. Specially marked packages of Kellogg’s brands like Frosted Flakes, Pop Tarts, Eggo waffles and more will feature “Fallen Kingdom” branding and give consumers the chance to win movie tickets.